Is this a great fix it job or an epic fail? It's certainly not going to pass any plumbing inspection! It's also NOT the way I'd do any home repairs. I'm not a home repair contractor by any means, but I definitely have done FAR better jobs at installing a sink. Fail. It's like putting a bandaid on an open wound that needs stitches. Lol. That bathroom needs to be burnt down and rebuilt. Fck that house has gotta be a fckin dump. Who are you when no one's looking? What do you think of people who like to stir the pot and cause drama? Happy International Bat Appreciation Day (11:50AM US). Do you like bats? What is your favorite color? What do you have planned for Easter if you celebrate? haha... that's a disaster. plastic doesn't last long with sun exposure, it's gonna fail. 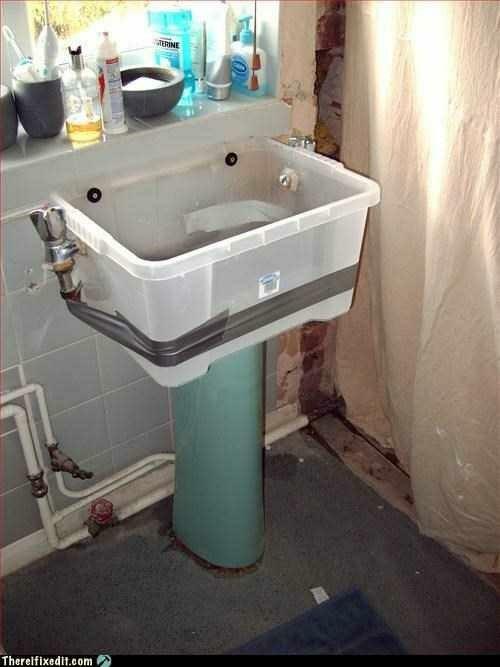 Redneck plumbing of the finest quality! Looks like a good job. The duct tape might not be a very long-term solution. The Spring Garden's Tea Time What do you think of when you think of the red? 10 Music Artists/Bands Have Taken Over My Playlist My Journey On GAG Relationship Advice Everyone Needs To Know! Home > Other > Is this a great fix it job or an epic fail?